I would like to start off this letter on a positive note. An NGO based out of Bangalore has done a survey across the country, in which Kerala has come in first in terms of Governance. This is a great achievement for our State and we applaud the Government in this regard. 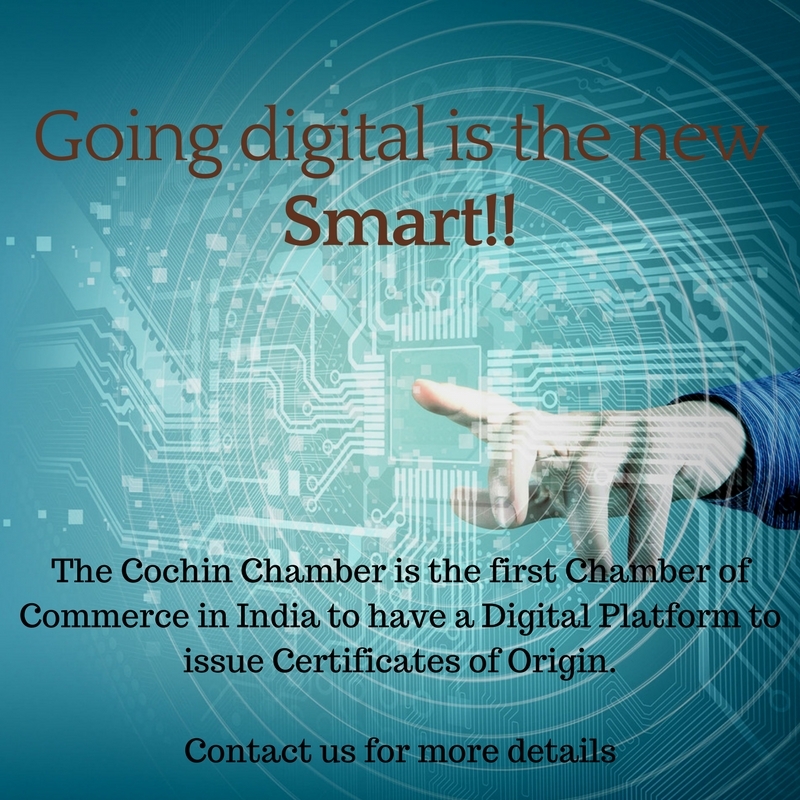 On behalf of the Cochin Chamber of Commerce & Industry I would like to congratulate our Government for this great achievement. As you all know the Cochin Chamber celebrated its 160th Anniversary in November 2017. The Valedictory Session of the 160 year celebrations, will be held later this year. On this occasion, the Chamber is bringing out a Souvenir commemorating its 160 year legacy. You must have received a mail in this regard already. I request all our members to support this initative in order to help us bring out the best possible Souvenir. This publication will showcase the Chamber Members besides having other sections of interest. You may contact the Chamber Secretariat for any assistance or clarifications regarding this. More details about the souvenir can be found in the Newsletter. has agreed to be a part of Quarterly Open House Sessions to clarify doubts and concerns regarding GST, which the Chamber has agreed to organize. We are also organizing a “Seminar on One Year of GST – Scheme & Coverage” on the 27th of July 2018 at Hotel Park Central, Ernakulam. The speakers of the session will be Advocates G. Shivadass and P.M. Prabhakaran from Lakshmikumaran and Sridharan Attorneys, Bangalore. Both of them have exemplary knowledge on the subject and have had vast experience having done several such programmes across the country. I take this opportunity to invite you all to this Session and to ask you to make use of the opportunities the Chamber gives you, for the betterment of your Organization and the Industry as a whole. The 10th CEO Forum Breakfast Meeting will be held on Friday the 10th of August, 2018. The topic for the session will be “Key Compliance Updates under the Companies Act, 2013 and Foreign Exchange Management Act, 1999.” Ms. Deepa Bhatia Chirayath, Leader – Entity Governance & Compliance, Tax & Regulatory, an expert on this subject from our Knowledge Partner, PwC India, will lead the Session. The programme, will be held at the Taj Gateway Hotel, Ernakulam from 08.00 hrs to 10.00 hrs. Request all our CEOs to participate in these ‘one of a kind’ Sessions organized by the Cochin Chamber. This is also an opportunity for you all to network with the ‘who is who’ of the industry in Kerala. Wishing you all a wonderful and fruitful month ahead. The Cochin Chamber of Commerce and Industry established in the year 1857 has completed 160 years of service to trade and industry. Marking this momentous occasion, the Chamber had, in November last year organised an Inaugural event at which the Hon’ble Vice President of India Shri. M Venkaiah Naidu was the Chief Guest. The Valedictory Session of the 160th year of the Chamber will be held in September this year. The details regarding the same will be intimated to you in due course. information regarding each of our Members besides other interesting articles by eminent personalities. The Souvenir will be released at the proposed programme in September. The Chamber is seeking your support in marking this occasion in a befitting manner. The Chamber is confident that, as always, the support and co-operation from your side will be there in this endeavour. The Chamber requests your support in this initiative by way of a sponsorship towards this effort. In return, the publication will carry a substantial write up/advertisement of your Company, including the logo of your Organisation and a photograph of the CEO. For any further clarifications or queries, please feel free to get in touch with the Chamber’s Secretariat. The Tenth Breakfast Meeting of the CEO FORUM 2017-18 will be held on Friday, the 10th of August 2018 at the Taj Gateway, Ernakulam. The Ninth Breakfast Meeting of the Cochin Chamber’s CEO FORUM 2017-18 was held on Friday, 6th of July 2018 at the Taj Gateway, Ernakulam. Ms. Nisha Menon, Director, PwC India provided updates on the notifications by RBI on the filing of the Single Master File /Entity Master File and the DIR-3 KYC to be filed by Directors as notified by the Ministry of Corporate Affairs during the Quick Bytes from PwC as a part of the Knowledge Sharing exercise on Tax matters. Ms. Sudakshna Thampi, Yoga and Meditation Consultant and Founder – InstantYogi spoke on the importance of Yoga in the stressed out modern day life. She also demonstrated and helped the participants experience the benefits of meditation which can be done even at one’s workplace. She further cleared the air about certain misconceptions about Yoga and encouraged the practice of Yoga to bring out the best in oneself. The Interactive Session came to a close with a Networking Breakfast by 10 am. Mr. Vijay Narayan Govind, Executive Committee Member of the Chamber presented a Memento to Ms. Sudakshna Thampi. The Chamber conducted an Open House with the Chief Commissioner, Central Tax, Central Excise & Customs Mr. P.N. Rao, I.R.S, to assist trade in sorting out the various issues being faced by them vis-à-vis GST compliance, refunds etc. At the recently held Regional Advisory Committee and Grievance Committee Meeting, the Chamber’s representatives who attended were able to highlight some of the grievances raised by members of the trade which the Department agreed to look into and sort out at the earliest. In this context, the Chief Commissioner, Mr. P N Rao, I.R.S had kindly agreed to address a meeting, convened by the Chamber, of members of the trade, exporters etc. to possibly find solutions to the problems being faced by trade and industry. Mr. P.M. Veeramani, dellivered the Opening Remarks. The Chief Commissioner addressed the audience and answered their queries. The Commissioner has agreed to conduct such Open Houses every 3 months along with the Chamber to clear issues related to GST within the industry. Mr. C.S. Kartha presented a Memento to the Chief Commissioner. Mr. P.M. Veeramani, delivered the Vote of Thanks. The Session was attended by more than 50 participants. In a recent ruling, the Jaipur bench of the Income-tax Appellate Tribunal (Tribunal) has, inter-alia, held that while the Commissioner of Income-tax (Appeals) [CIT(A)] has the power to enhance the assessment, it has no power to go beyond the matter arising out of the proceedings before the tax officer (TO) more particularly when the separate provisions for eventuality are provided under the Income-tax Act, 1961 (the Act). Accordingly, the CIT(A) is not entitled to enhance new sources of income under section 251(1) of the Act. PwC comments: This judgement reinforces the principle that the power of the CIT(A) to enhance the income under section 251 of the Act do not entitle the CIT(A) to travel beyond matters arising out of the assessment proceedings. This judgment affirms that the CIT(A) cannot tax a new source of income more particularly when separate provisions for such eventuality are enshrined in the Act. Business support/marketing support activities undertaken by Indian subsidiary do not create a PE in India for the foreign company. The Authority for Advance Ruling (AAR), in a recent ruling held that Indian subsidiary (providing business/ marketing support activities) will not constitute a fixed place permanent establishment (PE) of applicant in India as neither its main business was carried through Indian subsidiary, nor the premises of the Indian subsidiary was at the applicant’s disposal. The AAR also held that the applicant would not constitute a service PE in India as the directors of the Indian subsidiary would not provide any services or technical assistance to the applicant’s customers. With respect to agency PE, AAR held that as per the terms of the service agreement and addendum thereto, the applicant had retained with itself the authority, regarding its main business, to finalize its marketing strategies, to finalize terms of agreements/ contracts directly with customers and to accept or reject offers of customers. The Indian subsidiary would be left only to provide support services rather than act as an agent of the applicant and thus the Indian subsidiary would not constitute an agency PE. PwC Comments: AAR has reiterated an important principle that I Co of foreign company does not by itself constitute PE of foreign company. Unless the foreign company proposes to carry out its main business itself from an establishment in India which is at its disposal, Fixed Place PE is not constituted. Further, unless the foreign company renders services through its employees and personnel to customers in India or its I Co acts as an agent of foreign company, I Co would not constitute a service/ agency PE of foreign company respectively. While the introduction of the Insolvency and Bankruptcy Code, 2016 (IBC) was a welcome move by the Government last year, a holistic approach by amending the Securities and Exchange Board of India (SEBI) regulations for seamless process and compliance was lacking. A spate of amendments by the SEBI in the SEBI (Listing Obligations and Disclosure Requirements) Regulations, 2015 [SEBI (LODR) Regulations), SEBI (Substantial Acquisition of Shares and Takeovers) Regulations, 2011 (SEBI Takeover Regulations)d, SEBI Issue of Capital and Disclosure Requirements Regulations, 2009 [SEBI (ICDR) Regulations] and SEBI (Delisting of Equity Shares) (Amendment) Regulations, 2018 introduced through notifications dated 31 May, 2018 effective from 01 June, 2018 serve as a bridge between the IBC and the respective SEBI Regulations to further smoothen and streamline the IBC process. Shareholders’ approval shall not be required for material related party transactions by listed companies whose resolution plan has been approved under the IBC, subject to the resolution plan being disclosed to the recognized stock exchange within one day of approval of resolution plan. Shareholders’ approval through Special Resolution not required, if the following is done under a resolution plan under IBC and the same is disclosed to the recognized stock exchange within one day of approval of the resolution plan: A) Disposal of shares in a material subsidiary resulting in reduction of their shareholding to less than 50% or cessation of exercise of control over the subsidiary; or B)Disposal and leasing of assets amounting to more than 20% of the assets of the material subsidiary on an aggregate basis during a financial year. SEBI had in August 2017, exempted listed entities whose resolution plan had been approved under IBC from complying with the requirements of preferential issue of equity shares. The said relaxation has now been extended to preferential issue of convertible securities as well. However, provisions in relation to lock-in of securities would continue to apply. B) Provides an exit option to existing public shareholders at a price specified therein.It further provides that exit to shareholders of such listed entities should be at a price not less than the liquidation value, as determined under regulation 35 of the Insolvency and Bankruptcy Board of India (Insolvency Resolution Process for Corporate Persons) Regulations, 2016, after paying off dues in the order of priority, as defined under section 53 of the IBC.An amendment has been made to the effect that the shares of the company which have been delisted as per the above can re-apply for listing without any tenure restriction.PwC Comments: The plethora of amendments introduced by SEBI is apposite at a time when the need for a streamlined IBC process is of utter necessity. Hopefully, similar amendments may be carried out in other statutes also. Entity Master Form (EMF): Prior to the implementation of SMF, RBI will provide an interface to Indian companies and limited liability partnerships (LLPs) that have existing foreign investment, to input data on total foreign investment received. The interface for this one-time reporting will be available on the RBI website www.rbi.org.in from 28 June, 2018 to 12 July, 2018. Indian entities not complying with this prerequisite will not be able to receive foreign investment (including indirect foreign investment) and will be considered as non-compliant under FEMA, 1999. Single Master Form (SMF): The SMF will subsume the existing forms: Forms FC-GPR and FC-TRS (For Issue and transfer of shares), Form LLP-I & II (For Foreign direct investment in LLP and disinvestment/ transfer of capital contribution), Form ESOP (For Issue of employee stock option plan), Form CN (For Issue or transfer of convertible notes), Form DR (For Issue or transfer of depository receipts). SMF will also be required for reporting downstream investment (indirect foreign investment) in a company or LLP within 30 days from date of allotment as well as reporting of investment in an investment vehicle, including real estate investment trust, infrastructure investment trust and alternative investment funds within 30 days from issue of units. 1) In case of reporting of fresh issue of shares, details of amount received in tranches for issue of partly paid up shares/ share warrants is to be provided. 2) For reporting transfer of capital instruments from non-resident to resident, the acknowledgement letter for initial investment by non-resident is required to be enclosed. 3) In case of reporting transfer of shares with payment by way of deferred consideration, details of tranches, escrow arrangement and indemnity arrangement. 4) Relevant extracts of transfer agreement to be enclosed in case of reporting transfer of shares. 5) Details of repayment, conversion and transfer of convertible notes are required to be mentioned in case of reporting of convertible notes. For transfer of convertible notes from non-resident to resident, the acknowledgement letter for initial investment by non-resident is required to be enclosed. 6) Certain requirements have been made common to all reporting, including certificate from a company Secretary (which is currently required only in the case of Form FC-GPR) and declaration by non-resident transferor/ transferee (currently prescribed only for Form FC-TRS). PwC Comments: The integration of the extant reporting structures is a positive move by the RBI to simplify and rationalize reporting for foreign investment in India. There may be certain practical difficulties prior to implementation of the new form for the Indian entities to collate details on foreign investment, especially as the window for uploading such data on the RBI interface is open for only 15 days. 1) The circular refers to the observations of the Supreme Court (SC) in the case of Ispat Industries Limited and mentions that ‘place of removal’ is required to be determined with reference to ‘point of sale’ with the condition that place of removal (premises) is to be referred with reference to the premises of the manufacturer. 2) The circular mentions that where the contract for sale is FOR contract in the circumstances identical to the judgment in the case of Emco Limited and Roofit Industries Limited, where the ownership, risk in transit remained with the seller till goods are accepted by buyer on delivery and till such time of delivery, seller alone remained the owner of goods retaining right of disposal, the above principle would not apply. 3) The place of removal for an exporter would continue to remain the port in terms of circular no. 999/6/2015-CX dated 28 February, 2015. 4) The circular clarifies that in terms of the SC judgment in case of Ultra Tech Cement Ltd3 dated 01 February, 2018 the CENVAT Credit on Goods Transport Agency service availed for transport of goods from the place of removal to buyer’s premises was not admissible after amendment in CENVAT Credit Rules in 2008. 5) The circular has rescinded circular no. 988/12/2014-CX dated 20 October, 2014 and clause (c) of para 8.1 and para 8.2 of circular no. 97/8/2007-CX dated 23 August, 2007 from 08 June, 2018. The omitted portion of the circulars dealt with CENVAT credit of service tax paid on outward freight on the basis of place of removal. 6) The circular has mentioned that the past cases should have been decided on the basis of facts and circumstances of each case and judgment of SCs may be referred for further guidance in the matter. Any new show cause notice issued on the basis of this circular should not invoke extended period of limitation in cases where an alternate interpretation was taken by the assessee before the date of the SC judgment as the issue is in the nature of interpretation of law. PwC Comments: The clarification refers to various judgments of the SC and gives guidance to the tax authorities in adjudicating existing cases. The circular also clarifies inapplicability of extended period of limitation before the date of SC judgment for issuance of new notices. It will be interesting to see, whether the authorities will also restrict the demands for the past litigations to normal period, in line with the circular, where the notices have already been issued invoking larger period of limitation. ATM machine, on its own, does not constitute a place of business, and hence, banks are not required to provide details of ATMs, for the purpose of registration. Banks can issue a consolidated statement/invoice/ advice for the month with details of all charges and GST levied thereon. In case of separate registration of different business verticals of a banking company (e.g. separate registration for bullion business), the bank may opt for 50% credit reversal option in respect of such different business verticals (in this case, the bullion business). Requirement of reversal of 50% credit will not be applicable on services provided by distinct persons located in same country but will be applicable in case of services provided by distinct persons/ related persons located outside the country (since full credit is available only in case of registered service provider and registered recipient having same PAN). In case of disposal of capital goods on which the banks have availed the credit, for the reversal purposes, only the credit availed by the banks (i.e., 50% credit) would need to be considered. Bank/ insurance company can rely on the GSTIN provided by the customer and do not need to ascertain the actual place of consumption of services. Services provided by the banks to Reserve Bank of India/ United Nations, etc. are taxable as these are not specifically exempted or excluded from GST. No tax is payable on services provided without consideration to persons other than related persons/ distinct persons; however, GST would be payable on free of cost services received by related persons/ distinct persons located outside India. Further, in case of services provided at a concessional/ differential consideration to recipient (other than related/ distinct person), GST will be levied on transaction value and there is no requirement to increase the value of services by resorting to valuation rules. Derivatives are securities under the Securities Contracts (Regulation) Act, 1956 and are not liable to GST. Only related service charges or brokerage etc., would be subject to GST. In case of collateralised borrowing and lending obligation transactions, consideration paid by borrowing bank to lending bank is in nature of interest and will not be subject to GST. Only charges/ fees levied separately would attract GST. Future contracts are in nature of derivatives, i.e. securities and hence, are not chargeable to GST. However, where the future contracts have a delivery option and the settlement of contract takes place by way of actual delivery of underlying commodity/ currency, such forward contracts would be treated as normal supply of goods and accordingly, will attract GST. Any charges/ fees etc., will attract GST. Similar treatment is for forward contracts, where settlement by delivery is treated as supply of goods and settlement by payment of differential rates will lead to contract being considered as securities. Income earned from instruments such as repo/ reverse repo is in the nature of interest and hence, exempt from GST. Income earned from commercial paper/ certificate of deposit is not liable to GST. Where assignment or sale of secured or unsecured debts falls within the purview of actionable claims, GST will not be not attracted. Only charges collected in the course of transfer or assignment of a debt would be chargeable to GST. Further, sale, purchase, acquisition or assignment of a secured debt does not constitute a transaction in money; it is in the nature of a derivative and hence, qualifies as a security. Invoice/ cheque discounting is not liable to GST since it is akin to extending credit facility or loan. Additional interest charged for default in payment of instalment in respect of any supply, which is subject to GST, will be includible in the value of such supply and therefore, would be liable to GST. Interest on delayed payment of credit card dues is subject to GST. Interest on finance lease transactions will be taxable under GST. A finance lease is a method of borrowing against the asset. The interest represents the time value of the money expended by the bank in financing the asset. But, in a financial lease the ownership of the asset is with the bank. In essence, it is a ‘purchase the asset and lend it further’ transaction for bank. Therefore, neither the services are purely in the nature of extending loans nor the consideration for a financial lease is purely in the nature of interest. GST paid on bad debts cannot be adjusted against subsequent GST liability. Services not generally provided to account holders in the ordinary course of business such as finance lease, merchant banking, forex broking etc. would not qualify as services provided to account holder and the place of supply will be the location of the recipient of the services in such cases. In case of services provided to a customer from multiple locations, the location of supplier will be the home branch/ account branch. The other branches providing services to such customer actually provide services to the home branch/ account branch. Services provided by a bank or the Indian branch of a foreign bank to offshore branch/ head office (HO) would be taxable as inter-state supply; further, due to specific restriction, such services would not qualify as export of services. IGST will be payable on import of gold by the nominated bank at the time of clearance of gold from customs in case of receipt of gold on consignment basis. In case of gold loan to jewellers, the supply is to be considered as on the date of delivery of gold to jeweller and the value of supply should be determined on the basis of metal rate in global or domestic market. The bank should issue debit note/ credit note, when the price is finally fixed by the jeweller, along with GST for the difference in price. Interest on such gold loan will not be exempt. GST would apply on sale of re-possessed assets. The life insurance policies issued to non-resident Indians, where premium is received through Non-Resident External Account are taxable, since payments are made in Indian Rupees. In case of issuance of master/ group policy to a registered person where the premium charged is a single premium and not segregated based on the beneficiaries of the insurance policies, the place of supply for such policy will be the location of the registered person paying the premium, irrespective of the fact that beneficiaries may be located in more than one State. Recovery of stamp duty or securities transaction tax or any other tax by a broker will not be subject to GST, subject to fulfilment of pure agency conditions. No GST is payable on margin money received by the stock broker, except when such margin money is applied to services by the stock broker in its books of account. A tax invoice would need to be issued by a stock broker even if the contract note (issued under Securities and Exchange Board of India Regulations) reflects the GST amount.The FAQ document is available at http://www.cbic.gov.in/resources//htdocs-cbec/gst/FAQs_on_Financial_Services_Sector.pdf.PwC Comments: The financial services sector was awaiting for this FAQs document to give certain level of clarity on issues faced by the industry. This is the most comprehensive sectoral FAQs document issued by the Government and it clarifies most of the issues raised by the industry.Clarifications around the location of supplier (viz., home branch) where services are provided by multiple branches of the bank to multiple locations of customers, acceptance of the customer address for the purposes of determining place of supply, reliance on GSTIN provided by the customer, no GST on various financial instruments which qualify as securities, acceptance of a single consolidated statement/ advice as a tax invoice, no GST payment on appropriation of gold to jewellers should provide much needed certainty to the industry.The clarifications around eligibility of credit of services received from third parties and used at multiple locations etc., are quite important and will have general application, and not only to the financial services sector.However, some of the clarifications such as applicability of tax on stewardship services, outbound services by bank/ Indian branch to offshore branch/ HO, GST payable by the banks on correspondent banking charges etc., are likely to be further debated since the approach adopted by the industry on these issues has not been consistent.The industry would need to initiate a dialogue with the Government to arrive at a consensus so as to avoid potential litigations in the future, in case of difference in position adopted by the industry and the ones clarified in the FAQs document.